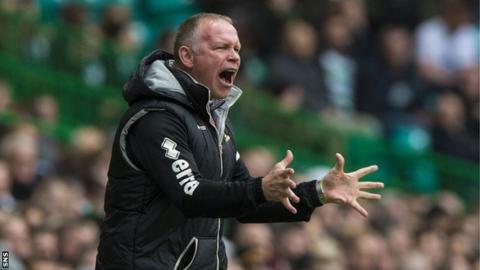 Inverness manager John Hughes insists his side can learn lessons from their 1-0 defeat away to Celtic. A second-half John Guidetti goal was enough to seal the win for the hosts. "I'm disappointed in the goal, I felt there was a free-kick on Danny Williams and so did the boys," Hughes said. "But we still have to keep that back door shut - we're all trying to charge forward to score a goal and we leave that midfield area a bit exposed. They countered and scored their goal." The Highlanders lost 5-0 on their last visit to Celtic Park and Hughes was keen to take the positives from Saturday's match. "The game-plan was to keep it tight, keep the shape of the team and grow into the game. We certainly did that, although we rode out luck a little bit," he told BBC Scotland. "In the last 20 minutes or so we had Celtic on the back foot a little bit. We gave as good as we got. "The last time we came here Celtic took us for five so it shows the massive improvement that's gone on at Inverness."